Last week, I looked at some of the basics for reading a Grand Tableau. Today, I want to look at the question of Houses. Houses are used to add additional information to your interpretations. They are also used to follow a thread around the spread, from one card to its House, and on. For either of these, you need to decide how you're going to define the Houses. My preferred method numbers the Houses as shown here. 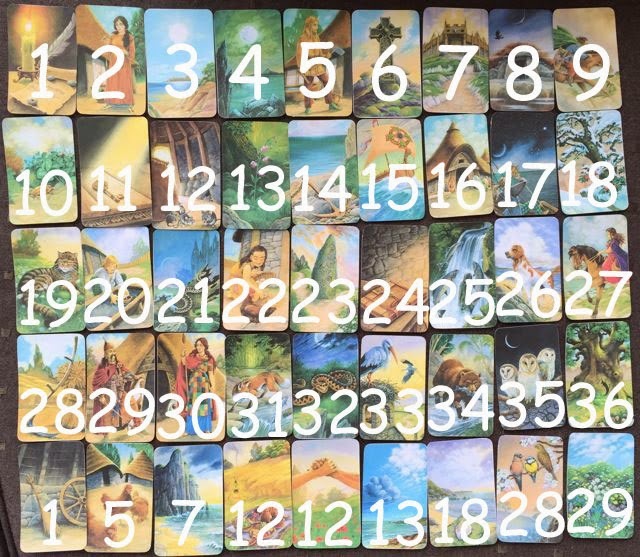 Basically, the first four lines of nine follow the standard Grand Tableau numbering, making it easy to remember, and it's only the last nine cards that are different. These are numbered the same as the extra cards: 1, 5, 7, 12, 12, 13, 18, 28, 29. That's all you need for reading Houses with this deck's extra cards! So, when you come to a card that has duplicates, you see if it is your "standard" card or a duplicate, so you know where on the GT to find its house: in the first four rows or in the last. For example, from the Woman card in position 2 on the GT, we go all the way down to the last card of the last row, as the Woman is my duplicate 29. Now, you decide what subject you want to read about: I choose work, and started at the House of the Anchor, my go-to work card. Owl in the House of Anchor (35) led me to Mice in the House of Owl (12), and Paths in the House of Mice (23). 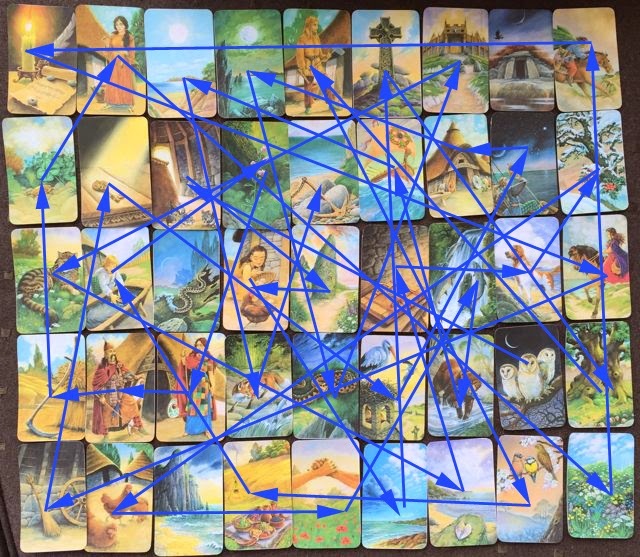 As you can see from the crazy network of arrows, this turned out to be a very long thread, incorporating 42 cards! Often in a 36 card GT you might get 4-6 threads, and in a 45 card GT it wouldn't be that unusual to get 5-7 threads, so having basically one thread is uncommon. I guess that just shows that at the moment my work is spreading into every area of my life! I won't go through interpreting the whole thread, but just give a very, very brief example with the mini-thread that remains outside it. Around the time I threw this GT, I also laid a smaller spread, which showed that there were some Mountains in my path. Here, the House of the Mountain contains the Shedding Snake, and the House of the Shedding Snake contains the Mountain. This can be interpreted as transformative obstacles that emphasise mountain-sized boundaries. The obstacles I was coming across did lead to completely reconsidering a few things, and pointed up that a large part of the issue was my not creating strong enough boundaries. You just take it one step at a time, Ellen :D In some ways, the thread exercise is pretty easy, as you read it as a sentence or paragraph, rather than having the extra elements of mirroring, knighting, diagonals etc... Still, you can see why I broke the posts on this topic up into three (and could have done more)!